Use this steel wheeled log wagon to haul large gardening items with ease! This cart is heavy duty and engineered to last. It's made from powder-coated steel and features thick pneumatic tires so it is sure to move over any terrain with ease. The removable sides makes this a flatbed, enabling you to haul other materials that may not fit in the confines of the sides like bags of mulch or soil. Additional dimensions: Tires: 10 inch diameter x 3 inches wide. Sturdy reinforced steel axles are 11. 5 inches long between tires. Overall height with sides up: 22 inches, 13 inches with sides down. Handle: 34 inches long x 8. 5 inches wide. Cart sits 12 inches off the ground. 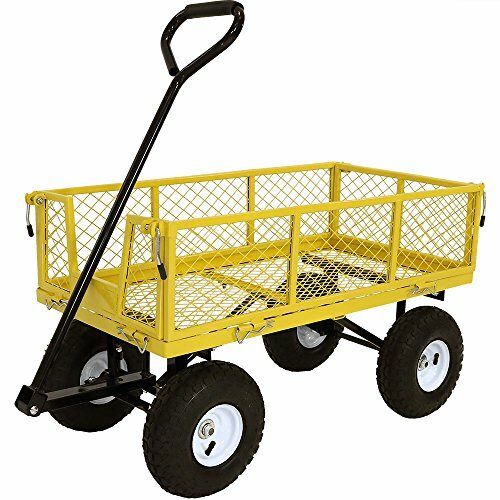 HOLDS HEAVY WORKLOADS: Lawn cart is 34 inch long x 18 inch wide x 9 inch deep and weighs 40 pounds. Also has a strong weight capacity of 400 pounds. DURABLE DESIGN: Outdoor yard cart is made from heavy duty steel mesh material and powder-coated yellow to make it sturdier and weather resistant. FUNCTIONAL FEATURES: Collapsible wagon features sides that can fold or be completely removed so it is easier to load and unload gardening materials. The extendable padded handle has a 180-degree turn range, while the reinforced axles and pneumatic tires are able to roll over any terrain. WORK SMARTER, NOT HARDER: The steel folding wagon is engineered so you don't have to make multiple trips hauling hefty materials. Simply load up the foldable cart with plants, logs, mulch, etc. and take it with you.